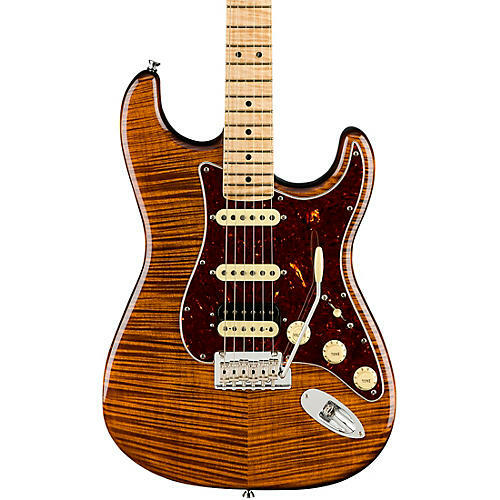 Fender's Rarities Flame Maple Top Stratocaster features a two-piece alder body with a flame maple Golden Brown top and a solid rosewood neck capped with a flame maple fingerboard for a totally luxurious look and feel. The Pure Vintage 65 Strat pickups add a classic voice to the more modern, custom DoubleTap™ bridge pickup which offers both a sweet humbucking voice and—via an S-1™ switch—a dynamic single-coil sound. Like the rest of the Rarities series, these are limited-edition instruments, carefully built from select tonewoods for discerning players.